Pronounced with an exaggerated accent on the final "e", "poche'" is a French architectural term for the all the stuff that is inside the walls between spaces. In architectural drawings, it is the stuff blackened in on the plans. For typical construction where all the walls are about the same thickness and both sides run parallel to each other, poche' isn't really a design element. However, back in the days of predominantly stone masonry buildings, the thickness of stone walls gave them a relative presence that allowed for their manipulation as architectural entities. The simplest treatment of poche' and the base cause of the term’s use is when architects describe carving into a wall to create a niche. In those cases they may describe using the poche' space of the building. In a sense, it is carving into the "solid" mass of the wall space even though in modern construction this space of the wall is certainly not stone or solid mass. Baroque plans are especially rich in their interesting manipulation of poche' to create geometrically shaped rooms. The resultant wall shapes between rooms, the poche', takes on a presence that is as "shaped" as the rooms and certainly more interesting than simply the space between two wall surfaces. 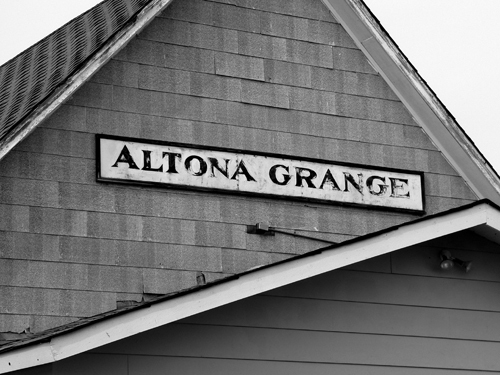 Just north of Boulder, Colorado is the Altona Grange Hall. It is one of the original 492 granges in Colorado, established in 1891. These buildings were built as part of the Grange movement of farmer solidarity known as the Patrons of Husbandry. They advocated for modern farming techniques, water rights protections, bank farm loan policies and railroad price fixing. The buildings become the social center, the "culture" of agriculture, of often very isolated farming communities. These are buildings built without architects, usually by the farmers themselves. Unlike Europe where so many farmers live in town and migrate daily out to their fields, the homestead movement in the United States occupied the land in a much more dispersed fashion. Farmers often lived great distances to cities or town and from each other. These buildings are some of the richest examples of truly vernacular building in the West. I find the building fascinating in its lack of consistency to roof pitches, materials usage, etc. As you can see, the siding and roofing changes for different locations, the various additions wrapping around the original building based on use and necessity, not aesthetics. But what ends up is a really dynamic building. This is architecture put together by the people who use it and have to maintain it collectively. It is not graceful or delicate, but it has a solid presence that comes from occupation and some very clear relationships. The main building is clearly dominant and the additions and sidecars are secondary. You can tell from looking at the building that the main hall is the center of the community, the other forms are there to support that main function. This is a simple, albeit not elegant, description of "spaces served and spaces in service" that Louis Kahn delineated in most of his better works and gives a building a clear sense of both its genesis and use. This modest building serves as a good lesson to architects designing buildings that stand isolated out on the plains. A simple, strong form needs to be strongly articulated to sit in the massive panaroma of the landscape and the small additions lend human scale and occupation. A beautifully simple building more satisfying that so many current architectural flights of fancy. The archive of photographer Richard Nickel was recently donated to the Art Institute of Chicago. Nickel is a hero in the Chicago preservation and architecture communities for his early and dedicated work to preserve and document so much of Chicago's early architectural history. Working throughout the 1950's and into early 1970's, Nickel tirelessly recorded much of the work of Adler and Sullivan, Daniel Burnham, Holabird and Roche, Frank Lloyd Wright and others. These were the ugly, dark days for urbanism and architecture in the US, as hundreds of magnificent buildings were demolished by private developers and public institutions to make way for "progress" and urban renewal. What was lost was priceless buildings, glorious creations of great architecture and great neighborhoods. Nickel not only took countless photos of endangered buildings, but he was also an ardent campaigner against the kind of wanton destruction that some Chicagoans were attempting. The demolition of Louis Sullivan's work was Nickel's prime target and his efforts included not only taking photos but saving actual pieces of soon-to-be-demolished buildings. The interior of the Chicago Stock Exchange building is a part of the Art Institute, on permanent display, due his work and that of other zealots he recruited. Louis Sullivan is now known as one of the greatest of all American architects and much of his body of work exists solely in Nickel's archive. Nickel's story ended tragically and in some mystery. His body was found inside the demolition site of the Chicago Stock Exchange building, buried under a collapsed stair. Under great risk, he often entered building sites where demolition was already underway, and his photos are often the only documentary evidence that exists of so many buildings. In the case of the Stock Exchange, he returned many times after the official salvage operation was complete to retrieve and document. His archive, some 15,000 photographs, prints and negatives, has been held by The Richard Nickel Committee and available for viewing only by professionals and academics. Hopefully now that it is housed at the Art Institute, some of this man's heroic and beautiful images can be viewed more easily by the citizens of Chicago, who have benefited so powerfully from his heroic efforts. A description of what a clerestory is and how it is used in architecture.